With sadness and mourning, the following article was written back in 2008 as a memorial to our beloved “Just-In”. This is in remembrance of our original Boykin Spaniel to Texas Trace. Just-In’s picture is proudly presented on each page of this website and is the center piece of our logo. There is much appreciation to Just-In and Greg for sharing their stories and experiences, but most of all the opportunity of enjoying Boykins Spaniels at Texas Trace with the entire family and the many extended family members. Without Just-In, there would be no “Texas Trace”. The photos on the left are of Curlee’s Just-In who passed peacefully with the help of our vet in May, 2006. The prognosis back in December 2005 was that Just-In had only 2 to 6 weeks left, so we are thankful for the 5 months Just-In gave us to adjust. Just-In was as true a faithful and loyal companion a person could ever have. We mourn his passing but take great pride in his being. Just-In, as is all our pups, was regarded as a full-fledged member of the family and was quite sure he was a human, not an animal. He went everywhere with us and if they would have issued him a frequent flyer card he would likely have more frequent flyer miles than the average human. He brought us all unabashed joy and happiness and instilled a pride that we have not experienced before or expect to experience anytime soon. Just-In was also loving and would eventually win over the most reluctant person. My spouse, Michelle, calls Just-In the King of All Dogs, and for good reason. He was a truly magnificent dog, with such character, intensity, drive and an aristocratic bearing. He was a certified alpha male; no therapy needed. All this is accurately reflected in the all his photos. Just-In left long before his time. His death is incredibly hard and wrenching. Recovery will be painfully slow, but forgetfulness will not be part of it. I have lots of stories and will try to remember them and record them, including the time he saved my life. “The best friend a man has in this world may turn against him and become his enemy. His son and daughter that he has reared with loving care may become ungrateful. Those who are nearest and dearest to us, those whom we trust with our happiness and our good name, may become traitors to their faith. The money that a man has he may lose. It flies away from him when he may need it most. Man's reputation may be sacrificed in a moment of ill considered action. The people who are prone to fall on their knees and do us honor when success is with us may be the first to throw the stone of malice when failure settles its cloud upon our head. Just-In was just such a dog -- as true a faithful and loyal companion a person could ever have. The following article was first published January, 2014 in The Boykin Spaniel Standard, Issue 12, pages 16-17 written by Roslin Copeland. 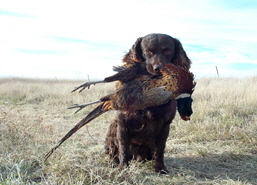 Desie was Roslin’s first Boykin Spaniel and a matriarch of Texas Trace. Desie lived 14 1/2 years - “a hell of a life” but passed away December 23, 2013 and in this article Roslin remembers with fondness her first Boykin Spaniel. Please click here to read and be prepared to shed a tear. Please visit our Retirement Page to read about their new adventures.